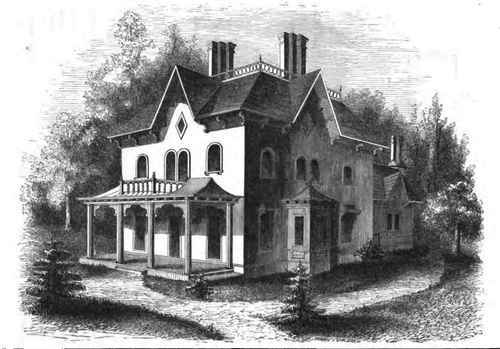 The accompanying drawings illustrate a cottage now being erected in Spring Valley, N. Y., for a merchant of this city," and which will be found, upon examination, to combine economy with beauty, and substantial comfort with expressiveness of purpose. The exigencies of the owner required a roomy house with plenty of sleeping apartments and convenient arrangement. Fig. 1 is a Perspective view; Fig. 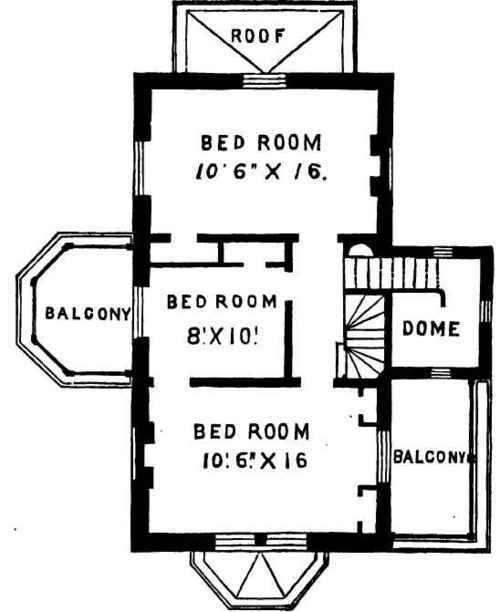 2, Plan of principal Floor; and Fig. 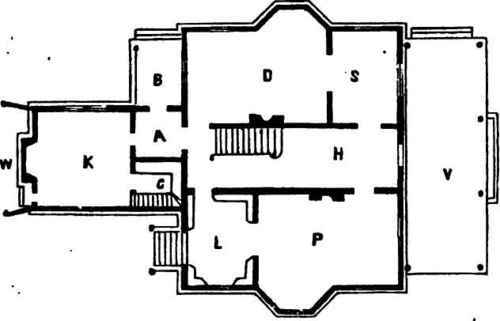 3, plan of Chamber Floor. The first story is 10 feet high, with a Parlor, Dining Room, Sitting Room, Library, Kitchen, Ac. The second story is 9 feet high, and devoted to sleeping apartments. The plans exhibit the dispositions of rooms, which are all of good size, airy, and plainly but substantially and well finished. The exterior, as will be observed, is simple in design, the ornaments being few, and the parts prominent and bold, rather than showy or elaborate in finish. Its site is a prominent one, in a quiet but beautiful valley, without any of those bold jutting parts which give a picturesque tone to the scenery, and that rather suggest a more irregular plan, and much bolder detail than is shown in our design. The building is now being completed by J. W. Warren, builder. Such a cottage as the foregoing can be erected in a plain manner for $3,000. In the present instance it will' cost, in the most complete manner, with surroundings, $6,000. This design is given as one well adapted for a village or rural residence, where economy of space and expense are desired to be combined with an agreeable exterior and appearance of interior spaciousness. This house was built at Hamilton Park, New Brighton, Staten Island, about four years ago, at a cost of six thousand dollars, and is one of the group of twelve (all different in design) alluded to in the May number. 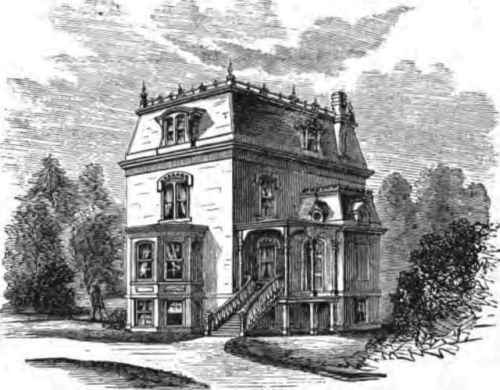 It is built of brick, with brown stone trimmings and Mansard roof, with slate covering - has a basement, two stories, and an attic; and the attic affords good comfortable rooms, ten feet high, with an air space between the ceilings and roof. The side walls being partly formed by the Mansard roof, are back plastered between the rafters, and the slate is laid upon tarred paper. All these precautions were taken to prevent dampness, heat, and cold from penetrating too readily. Fig. 144. - Rural Residence. The basement walls are sixteen inches thick; those above are twelve inches, except the walls of the projections that form the hall and library, which are only eight inches. The basement contains the kitchen, laundry, and store-rooms. The first story is so arranged that the several rooms communicate by large, double folding doors, and may be opened into one spacious interior, and still are accessible separately. The projecting part of the library or bay extends up only one story, and forms a balcony in the second story. Though the dimensions of the hall are small, a cramped appearance is avoided by the Mansard roof over it forming a dome, giving a ceiling of eighteen feet high to the hall, with colored glass in the skylight and dormer windows. At the rear of the dining-room a bay is built out, one story high, to afford the closets of a butler's pantry and a dumbwaiter. All may be shut out by large double folding doors opening into the pantry from the dining-room, or the folding doors may be opened, and are so arranged that they will shut against the closets, and give the appearance of a bay window to the pantry corresponding to the bay windows of the parlor when the folding doors between the parlor, vestibule, and dining-room are opened, thus securing on a small scale that appearance of spaciousness so difficult to obtain at a moderate cost. Fig. 145. - First Story. Fig 146. - Second Story. 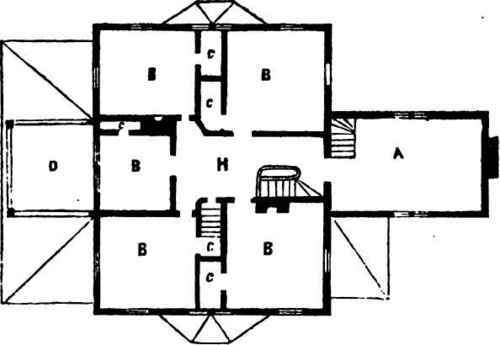 The second story has three, and the attic four bedrooms, making seven bedrooms in all, and also a number of closets. 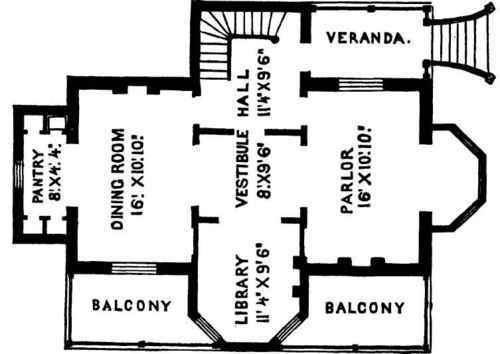 Added to these, the parlor, library, dining-room, and butler's pantry, of first story, kitchen, laundry, store and cellar-rooms in basement, it may readily be seen how it may meet the wishes of a family.